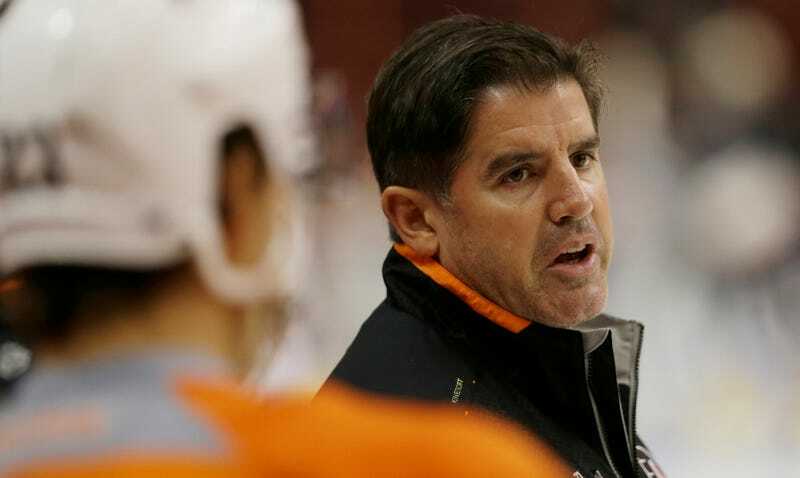 Just three games into the season, the Flyers have parted ways with head coach Peter Laviolette. Surprisingly, he could not win given a garbage roster and some guys they pulled off the street in net. Laviolette took over midway through the 2009-2010 season, snuck in through the postseason's back door, and went all the way to the Stanley Cup final. The next two seasons were uneventful second-round playoff losses, last year saw the postseason missed altogether. The Flyers were pegged to be even worse this year, with Laviolette unlikely to stick around for the needed rebuild, but an 0-3 start made things happen quicker than expected. Three games is a record for an NHL coach's firing. And with Laviolette's ouster, Chip Kelly is now the longest-tenured head coach in Philadelphia. Assistant Craig Berube will reportedly take over the Flyers. A famed fighter in his playing days, you might want to get seats behind the bench for Flyers-Avalanche.